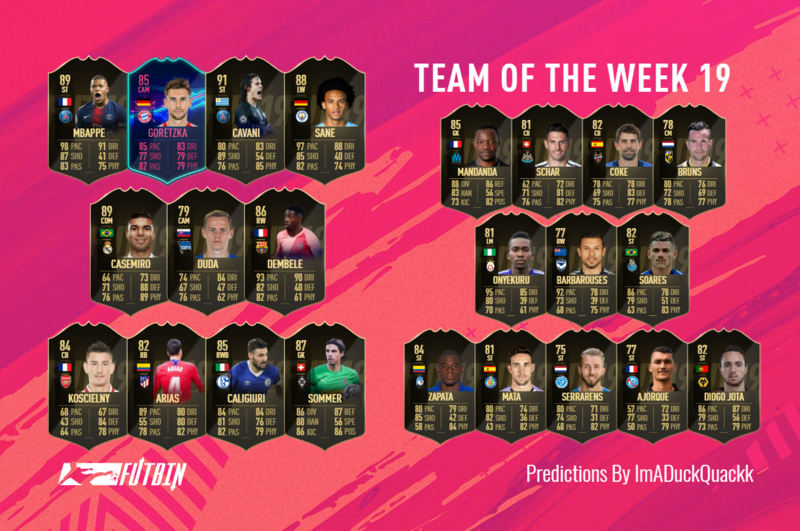 After two fairly shocking weeks, it looks like TOTW 19 is ready to make up for the pain. A superstar lineup leaves us spoilt for choice, however the amount of top performances this week also makes predicting the correct 23 man squad extremely difficult! With that being said, we have put together a 23 man shortlist, so be ready to get excited! As usual we kick start things with a goalkeeper, and this week our journey begins in Germany. Gladbach took the points with a narrow 1-0 win away to Leverkusen this week. Despite Gladbach taking the points, it was actually Leverkusen who were on top for the majority of the game. Sommer faced a total of 22 shots, and made 10 saves across the match. He may not have scored the winner, but he is the soul reason his side took the points. Arsenal vs Chelsea, a London Derby that left most football fans expecting only one result. This is football however, and we should never expect things to be such smooth sailing! On the day it was fairly one sided, as Arsenal seemed to dominate the travelling Chelsea. Lacazette put the hosts up initially, then it was Koscielny who finished them off with the second. A clean sheet, a goal and an incredible turn in form, should be enough to see this Frenchman make the cut here. Across to Spain now, where we face a more difficult decision when it comes to selecting who could receive the Inform. Atletico Madrid took the points with a 3-0 away win to SD Huesca. Koke was great on the wing, with a goal and an assist, but it was the defence who stole the show. A clean sheet across the board and goals from both fullbacks leaves us with a very tough choice to make. On the day, Arias received a better match rating than Hernandez, and due to this alone, he gets our vote here. Schalke were hosts to Wolfsburg this week, and with a fairly lacklustre campaign so far this season, the hosts really needed the win. Luckily for them, their right-back Caligiuri was in fine form. Solid defensively, he helped lock down Wolfsburg for the majority of the game, but the reason he makes the lineup this week, is for his attacking finesse. Scoring once from open play and a second from the spot, he scored both goals for Schalke, ensured they took the points, and wrapped up the man of the match award too. We remain in Germany for a while here, as we head across to the match between Nuernberg and the travelling Hertha Berlin. Duda has had a solid season so far, and with 9 goals alongside his 3 man of the match awards, it's a surprise we haven’t seen him feature sooner. This week however, he helped guide Hertha Berlin to a 3-1 victory in the league, scoring twice, while putting up a near perfect performance from start to finish. Staying in Germany now, where we finally see a possible OTW upgrade for this young German superstar. Bayern we’re away to Hoffenheim on Friday, where they took all the points during s comfortable 3-1 win. Goretzka was fantastic from the midfield, putting in an incredible performance, while scoring twice to ensure he took the man of the match award. Back across to Spain now, where finally a Real Madrid match takes the spotlight, and it’s for all the right reasons. Real Madrid played hosts to the travelling Sevilla this week, and after an absolutely dominating 90 minutes, it was the hosts that left with all the points in a 2-0 win. Now the player we opted to include was Casemiro, with a goal and fantastic performance throughout, however Modric was simply sublime, managed a goal, scored the highest match rating and could easily steal this spot. The only question left for EA, is would they rather a different superstar so soon after TOTY? After a couple of weeks with fairly weak lineups, it looks like we are back with a bang. As we approach the attacking nominations for this starting eleven, things only go from strength to strength. Manchester City did the job against Huddersfield on Sunday, as they secured the win with a 3-0 win. Now EA could very easily hand this Inform to Danilo, with a goal and a clean an sheet, but with 2 Premier League Defenders already in the mix, it feels right to look further forward. Sane scored and provided an assist, while taking the man of the match award. This could very possibly be enough for a second Inform this week. From one difficult decision to another now, and yes, I am fully aware that a goal isn’t usually enough for a second inform, but his match rating and performance was sensational, and hence he sneaks into our lineup. Barcelona were 3-1 winners over Leganes on Sunday, and just in case there weren't enough overpowered French cards currently in the game, a RW second inform Dembele, should ensure that problem is fixed. It is important to mention that if it wasn’t for the numerous La Liga defenders already making the lineup, Alba would be, and still could be, in with a great chance too. Now onto something special, something that would please anyone who stuck with their Weekend League games, and grinded out the best possible result. PSG absolutely obliterated Guingamp on the weekend, with a monumental 9-0 win. Neymar was incredible from the midfield, scoring twice and assisting a third, with a performance that would usually secure him a spot. Cavani however took this one step further, securing himself a hat-trick, while also providing two assists as well. It’s extremely rare for EA to include two players from one match, but the last time we saw a double hat-trick, both Ajax players made the final cut. We have already spoken about PSG’s dominance, so let’s focus on Mbappe now! It wasn’t long ago that his TOTY card was in packs, and we could already be seeing yet another special card entering packs now. With 3 goals and an assist, he falls just short of what Cavani achieved, but with a perfect match rating as well, surely we see them both make the cut here! Onto the bench now, and up first we have an extremely difficult goalkeeping selection to make. We have already mentioned that Handanovic has a chance of stealing this spot, but with most of the top draw performances coming from the Bundesliga, predicting the second goalkeeper becomes incredibly tough. Marseille were on the road this week as they travelled to Caen for their Ligue 1 fixture. It was the visitors who took the points with a 1-0 win, a win in which Mandanda played a huge part. Newcastle and Cardiff went head to head on Saturday, and with both teams within touching distance of the relegation zone, neither side could afford to drop points. The match itself was rather one sided, with Newcastle taking the points in a comfortable 3-0 home win. Schar was nothing short of sensational, not only did he lock down Cardiff’s attack, but he also found the back of the net twice. Two goals and a clean sheet from a center back should be more than enough for an Inform here. Back across to Spain now, where Levante were 2-0 winners over the travelling Real Valladolid. The match stats were fairly even across the 90 minutes, but it was the home sides clinical nature in front of goal, that was the difference on the day. Coke was an absolute rock at the back, undertaking his central position like a pro. It was also Coke who opened the scoring, and with a clean sheet alongside the goal, it was simply too much for us to ignore this week. FC Groningen picked up the points with a 3-0 home win over Heracles this week. Bruns was fantastic from his central role, dominating the midfield and controlling the match from the start. On top of this, he then went on to find the back of the net twice, and as we know, 2 goals alongside a top draw performance, is usually more than enough from a central midfielder. Galatasaray made light work of the travelling Ankaragucu this week, as they picked up the points with a 6-0 masterclass. Once again there were several sensational performances, however only one man could take this spot. Onyekuru, who played on the left, was simply breathtaking, scoring for fun as he secured his hat-trick, and stole the man of the match award too. All the way across to Australia now, where a match between Brisbane Roar and Melbourne Victory provided fans with 5 fantastic goals. These goals however weren’t shared easily, as Melbourne Victory were the team behind each and everyone of them. Barbarouses was in fine form on the day, dominating the match, while securing his hat-trick along the way. Porto were on the road this week as they traveled to Chaves for their Liga Nos fixture. The game itself was fairly one sided, with Porto picking up an easy 4-1 win. Soares was a man in form, scoring not once, not twice, but three times, securing his hat-trick, the man of the match award and his place within our predictions this week. Back across to England now, where we find a match full of drama, goals and suspense. Wolves pulled off a last second win against Leicester this week, in a game that kept every fan on the edge of their seats. Poor defending from both sides ensured the goals were flowing, and in a match that ended 4-3, there was only one man to take this spot. Jota scored a hat-trick, giving himself more goals in a single game than he had managed all season, an incredible performance, and an Inform just has to be around the corner. Monaco attempted to strengthen their side in this window, signing experienced, older players such as Naldo and Fabregas. Naldo had far from a dream start to his Monaco career, with a straight red after just 7 minutes. Things then only got worse for the struggling French side, as they lost the match 5-1. Strasbourg were fantastic though, and selecting just one player from such a great team performance is incredibly tough. Our nomination has to go with the man of the match though, Ajorque. Scoring twice and assisting a third, he lead from the front, only adding to Monaco’s misery. Back over to Italy now, where a travelling Atalanta embarrassed Frosinone with a 5-0 win. While the squads performance was solid, one man stole the spotlight for the entire match. Zapata simply couldn’t stop scoring, finding himself slipping past defenders, terrorising the goalkeeper and ultimately scoring four goals in a world class performance. Most weeks we see a couple of hat-tricks slide into our predictions, but every now and again we have a week where strikers simply can’t stop scoring. De Graafschap picked up the points with a 5-0 win at home to Fortuna Sittard on Sunday. A magnificent performance from Jebli saw him bag two goals, while dominating the midfield, however sadly he just misses out this week. Serrarens was the man of the hour, bagging himself a hat-trick and making his way into our predictions too. Our final match this week sees us taking one last trip across to Spain, where Getafe were comfortable 4-0 winners at home to Deportivo Alaves on Friday. Looking across the stats, there are three possible candidates for this spot, with each of them carrying a serious chance. Cristoforo was magnificent in the midfield, providing two assists and controlling the match. While Molina was mesmerizing up top, scoring twice from open play before being substituted in the 76th minute. Our selection however, goes with the other striker Molina, for his two goals and 1 assist contribution during the match.